The tour opens Jan. 24 in Santa Ana, Calif., and travels across the U.S. and back — hitting Toronto, Montreal and Vancouver as well — before wrapping up in Los Angeles on March 5 (see full dates below). The trek follows the release last May of the band’s 12th studio album. It is not, however, the so-called “Monsters of Industrial” tour proposed this past summer by Front Line Assembly mastermind Bill Leeb, who launched FLA after leaving Skinny Puppy in 1985, and suggested the two acts should tour together in support of their respective new albums, with Skinny Puppy headlining. 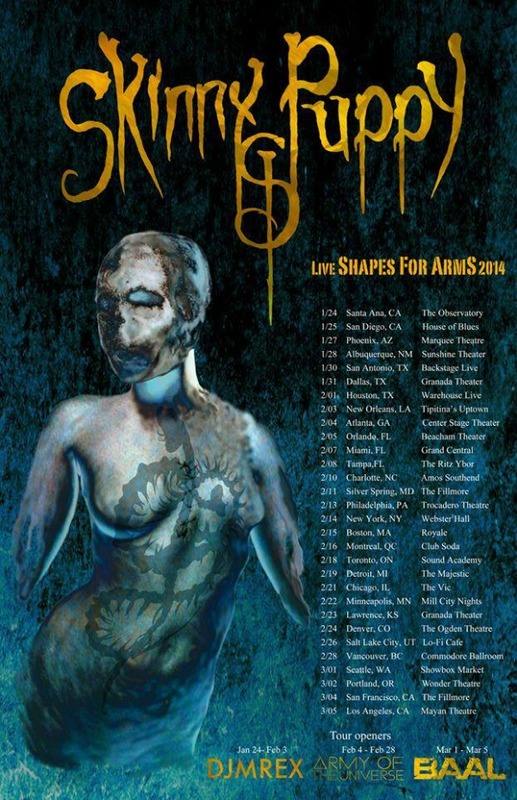 Support act on the Skinny Puppy tour include DJMREX, Army of the Universe and Baal. I was hoping SP would take up Front Line Assembly’s offer to tour together to support their respective new releases this year. Too bad it did not pan out. Cannot wait, really looking forward to the new material live! I wanted the SP/FLA tour also, but I can’t wait to see this tour. Hopefully FLA will get out on the road, too. Greatness. Was hoping for Austin Tx date, but San Antone will have to do. Let the avant-garde mayhem begin! Kinda funny that I’m traveling to SFO to see Tosca on March 4—a direct conflict in every sense. *Might* be able to catch SP on the 2nd in PDX at the Wonder (Ballroom, not Theatre), for the first time since ~’86.